Sulfuric acid is a useful acid to have on hand for a variety of home chemistry projects. However, it is not easy to obtain. Fortunately, you can make it yourself. Actually, this method starts with diluted sulfuric acid, which you boil to make concentrated sulfuric acid. This is the safest and easiest method of making sulfuric acid at home. Battery acid, which may be purchased at an automotive supply store, is approximately 35% sulfuric acid. In many cases, this will be strong enough for your activities, but if you need concentrated sulfuric acid, all you need to do is remove the water. The resulting acid will not be as pure as reagent grade sulfuric acid, so keep this in mind. If you aren't in a hurry, you can concentrate sulfuric acid by allowing the water to evaporate naturally. This takes several days. Place an open container of sulfuric acid someplace with good circulation, safe from the possibility of a spill. Loosely cover the container to minimize contamination with dust and other particulates. Wait. The water will evaporate out of the solution, eventually leaving you with concentrated sulfuric acid. Note that sulfuric acid is highly hygroscopic, so it will retain a certain amount of water. You would need to heat the liquid to drive off the remaining water. The fastest method to concentrate sulfuric acid is to boil the water out of the acid. This is fast but requires extreme care. You'll want to do this outdoors so that you won't be exposed to acid fumes, using borosilicate glass (e.g., Pyrex or Kimax). There is always a risk of shattering a glass container, no matter what you are heating, so you need to be prepared for that possibility. Do not leave this project unattended! Heat the battery acid in a borosilicate glass pan. When the liquid level stops dropping, you will have concentrated the acid as much as you can. At this point, the steam will be replaced by white vapor, too. Be careful to avoid inhaling the fumes. Allow the liquid to cool before transferring it to another container. Seal the container to prevent water from the air from getting into the acid. If the container is left open for too long, the sulfuric acid will become diluted. It's advisable to keep baking soda (sodium bicarbonate) or another base on hand. If you spill some acid, you can quickly neutralize it by reacting it with the baking soda. Simply sprinkle baking soda on the spill. Be careful to avoid contact with the sulfuric acid! 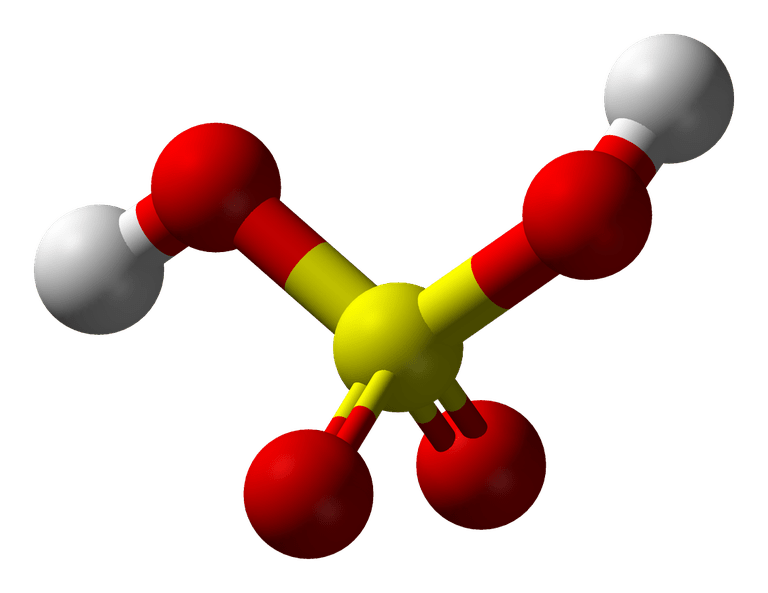 Sulfuric acid is one of the strong acids. It is extremely corrosive and will react vigorously and unpleasantly with skin, mucous membranes, clothing and just about anything else it touches. Do not breathe the vapors, do not touch the acid and do not spill it. Tie long hair back, wear goggles and gloves and cover exposed skin. Don't use metal pans or utensils. Sulfuric acid reacts with metal. Also, it will attack some types of plastic. Glass is a good choice. Sulfuric acid reacts with water in an exothermic reaction, but dilution with water is the best way to deal with an acid spill. Be sure to have copious amounts of water available, just in case something goes wrong. You can flood a small amount of acid with water. One the acid is diluted, it can be neutralized with a weak base, such as baking soda, Caution: Sulfuric acid will splash when mixed with water! If you are going to work with this acid, know and respect its properties. Dilute sulfuric acid may be concentrated by boiling the liquid. Because fumes will be evolved, it's best to concentrate sulfuric acid outdoors or under a fume hood. Battery acid is about 35% sulfuric acid. You can purchase it at an automotive supply store. It may not be on the shelf, so ask for it. Battery acid may be sold in 5-gallon boxes, with the acid in a heavy duty plastic bag and a plastic tube to dispense the liquid. The box is heavy; it would be disastrous to drop it. Therefore, it's a good idea to know what to expect. It's practical to dispense a working volume of acid, rather than try to deal with the entire container. Although the acid may come in a plastic container, it's best to store this acid in a glass bottle. Sulfuric acid reacts with some types of plastic and may corrode a plastic container. I used a glass wine bottle that had a plastic screw-top cap. Whatever container you use, be certain to label it as sulfuric acid and poison and store it somewhere that children and pets can't get to it. Also, don't store acid with ammonia because the two chemicals mix to release toxic fumes. Do You Know the Names of 10 Common Acids? Why Can You Drink Vinegar but Not Dilute Sulfuric Acid? Do You Know How To Make a Sulfuric Acid Solution?